Safe Driving Tips for Arizona’s Monsoon Season - Hegarty-Haynes Insurance, Inc.Hegarty-Haynes Insurance, Inc. 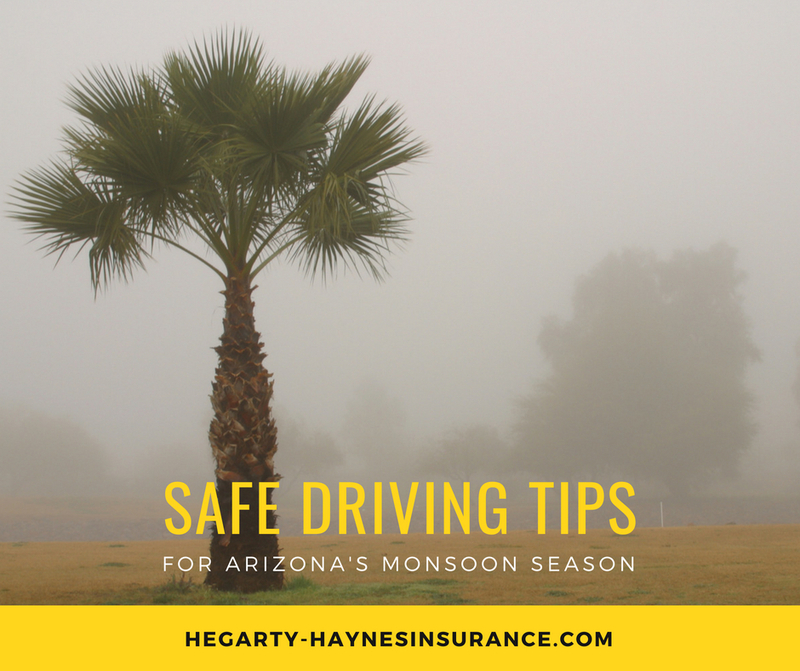 Safe Driving Tips for Arizona’s Monsoon Season - Hegarty-Haynes Insurance, Inc.
An Arizona summer provides many opportunities for staying active, boating in area lakes, and visiting popular venues. Families may also choose to escape the heat and camp up at the Mogollon Rim. This can result in a lot more people on the roadways – sometimes in less than ideal driving conditions. Arizona’s monsoon season often causes these conditions. Arizona’s monsoon season runs from June 15th to September 30th each year. Residents of the Grand Canyon state can generally expect frequent lightning strikes, heavy downpours, and strong winds. Haboobs and flash floods are not uncommon. Here are some safe driving tips for Arizona’s monsoon season. The National Weather Service issues severe weather warnings. If emergency alerts are enabled, you may receive these on your phone. You can also tune into local television and radio stations for the weather. @NWSPhoenix Tweets warnings as well. Information such as area(s) affected, potential hazards and exposure, and an estimated time to expect the “storm in effect” are included within these alerts. It is a good idea to stay off the road during severe weather. That, however, is not always feasible. If you find yourself caught in a foreboding wall of dust like the one we witnessed last Thursday, August 2nd, pull safely off the road and wait for it to pass. Although most storms are short, keeping a well-stocked emergency roadside kit, along with bottled water and non-perishable snacks in your vehicle is advised. Keep these rules in mind: Do not stop in travel or emergency lanes – you want to pull as far off the road as possible; and stay inside your parked vehicle with your seatbelt fastened, your headlights off, and your emergency brake on. Avoid areas prone to flooding. According to the Arizona Emergency Information Network (AZEIN), “six inches of fast moving water can knock down an adult, and 18 inches of water can carry most vehicles away.” Obey all posted signs and barricades. Exercise extreme caution when driving through standing water as well. There is no way to know what condition the road is in under it. It is also possible for the depth of water to be deceiving. Always use your headlights in poor weather. This can make your car visible to other drivers around you, thus improving your safety. Yellowed, foggy lenses can have the opposite effect, and may even restrict your headlights’ ability to illuminate the road. They should be regularly cleaned or restored. Depending on cruise control, even adaptive cruise control, is not recommend during rainy weather. Here’s why: It can cause the vehicle to lose traction and ultimately hydroplane (slide uncontrollably). Refrain from using any type of cruise control whether it is raining, or the roads are wet. When it is raining, or the roads are wet, driving too fast can be dangerous. The friction between your tires and the road are reduced in these conditions. Water can also affect your brakes response time. Experts recommend slowing down and increasing the traveling distance between you and the car in front of you. As an independent insurance agent, Hegarty-Haynes Insurance, Inc. is committed to providing our customers with superior service and solid insurance solutions at affordable prices. Contact us today at (480) 820-2297 for a free auto insurance quote.